The financial year of 2017 was closed with record sales for the fifth year in succession, even though the expectations could not be fully met due to negative currency effects. With sales of 456 million EUR, the success of 2016 in the Group was exceeded by 9%. In 2018, the market demands in the global competitive environment did not decrease. However, the CHT Group has adjusted its policy to the increasingly difficult market environment and the current economic developments in Great Britain, China, Turkey and parts of Central America. For 2018 CHT (including ICM Silicones Group) expects a further sales growth of about 13%. We assume that compared to the previous year the EBIT is better but once more it probably falls slightly short of expectations. The CEO had do tackle further important topics this year. He and his Management colleagues had a critical look on the half-time result of the Agenda 2020. In 2015, the CHT Group had set quite ambitious goals. Besides an organic sales growth to 500 million EUR by 2020, the Group had aimed at covering white spots both in terms of technology and market segments. 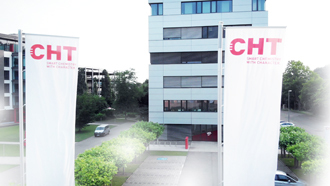 In addition, CHT not only aims at being its customers’ number one supplier but also at being the leading reference for sustainable chemical solutions. Especially in this field CHT has recently developed to the front runner in its traditional business field, textile chemicals, which can be seen by the great number of ecologically certified product and process solutions. Moreover, CHT set its own sustainability goals which go far beyond the legal requirements. In 2018, CHT’s commitment was honoured with the first prize in the national Responsible Care competition of the chemical industrial association VCI. CHT decided to no longer use any critical chemical raw materials such as e.g. fluorocarbons and formaldehyde. What had started as part of a project in 2015, has now become part of normal company processes. Since the beginning of the project CHT has eliminated the majority of critically classified raw materials from its processes and products. Since the end of 2017, fluorocarbons based on C8 chemistry have no longer been sold. Almost every day, the range of formaldehyde-free products has been increasing, too. Moreover, more than 3,000 tonnes of silicone products without critical by-products were sold in 2017 thanks to an investment in modern distillation plants. Even a global player like CHT has to deal with so-called white spots in market cultivation. It was another element of the Strategy 2020 to identify such spots and cover them afterwards. Last year, we successfully covered the white spot USA by acquiring ICM Silicones Group. Besides this, we successfully started the market development in Central Africa and Central America. The integration of the new group of companies into CHT goes according to plan. CHT is particularly proud of the fact that the work in the numerous international expert teams has been running really smoothly and successfully. It is a well-known fact that most acquisitions fail during the integration process. The good sales developments in the field of silicones prove that this is not the case in Tübingen even though this product group has been especially affected by raw material price increases and shortages since mid-2017. The impressive half-time balance of the Agenda 2020 was, however, not drawn by the Management alone. About 100 worldwide executives of the group of companies met at the first “All Hands Meeting” in Lisbon in the middle of the year. In a two-day meeting the participants jointly drew a balance of achieved goals and set the course for a successful implementation of the second half of the Agenda 2020.